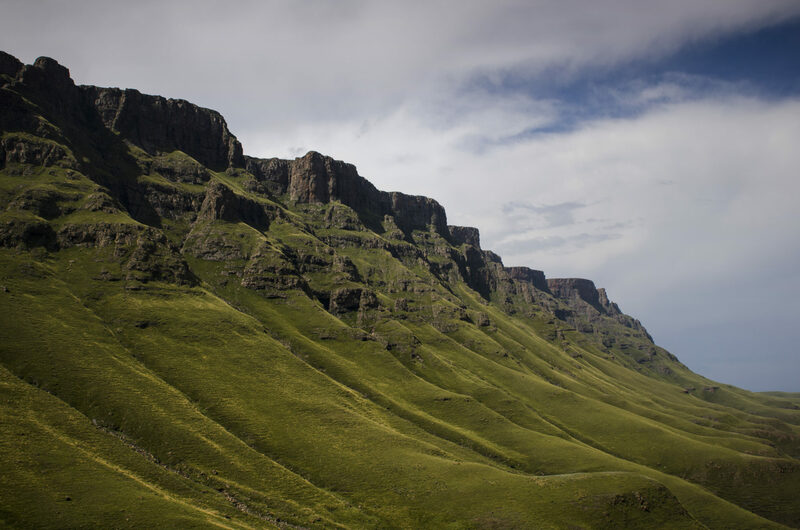 Stateless and untamed: The Sani Pass between South Africa and Lesotho is considered one of the most beautiful mountain passes in the world - but also one of the most dangerous. However, this neither keeps locals nor tourists off. “See you again,” mumbles the immigration officer. He stamps my passport with force, pushes it back under the glass pane and garnishes his gesture with a friendly smile. How nice for people to smile at you without provocation. Bye, South Africa! We now find ourselves in No Man’s Land, as we still have a way to go from this western border control in South Africa until we reach the Kingdom of Lesotho. Nobody owns this area; it is constitutionally masterless. That sounds grimmer than it really is. In fact, this is one of the greenest, roughest and most unique landscapes on the African continent. The two countries are connected by a narrow strait: the infamous Sani Pass, third steepest mountain pass in the world. 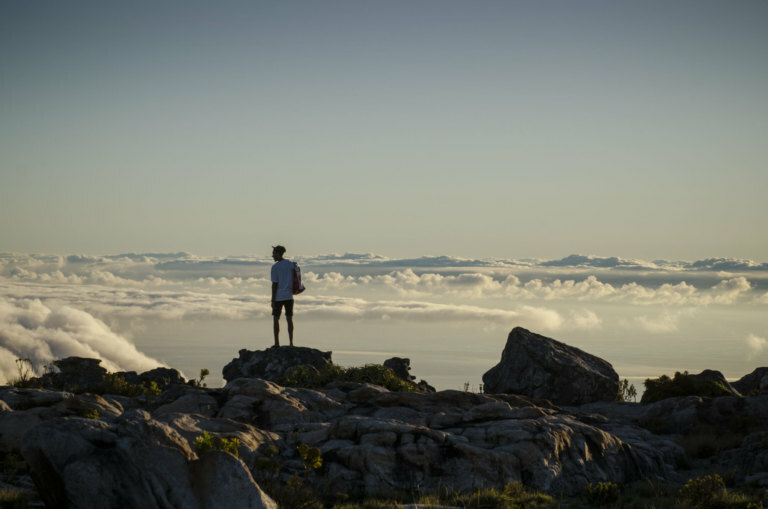 If you leave South Africa at the border hut, 20km of nature lies ahead of you, ready to take your breath away. And that’s not just because of the ever-thinning air with every metre you ascend. The Sani Pass is by no means an easy drive. 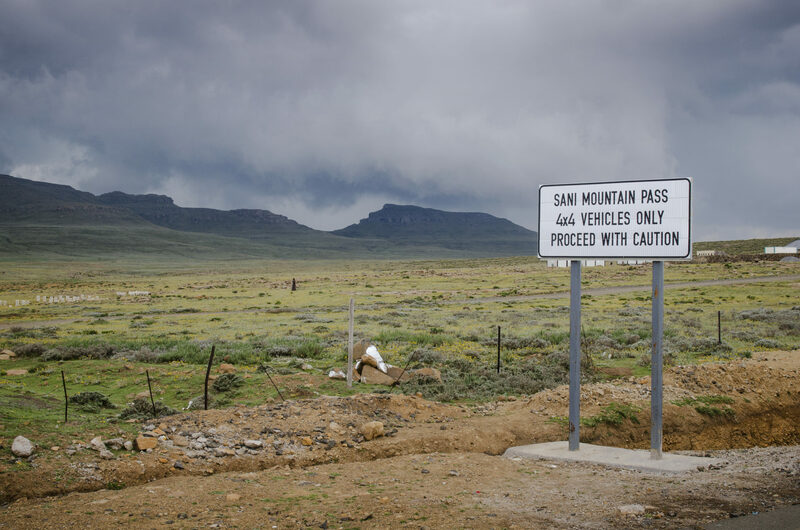 The route between border posts of Lesotho and South Africa and the pass summit may only be driven over by four-wheel drive vehicles, according to a 1987 law. Anything else would be impossible anyway, as the pass is too narrow and steep, the nature around it too capricious. The route is stretched around three phases: tarred roads, dirt roads and then the last phase, on which you judder over rough and smooth. 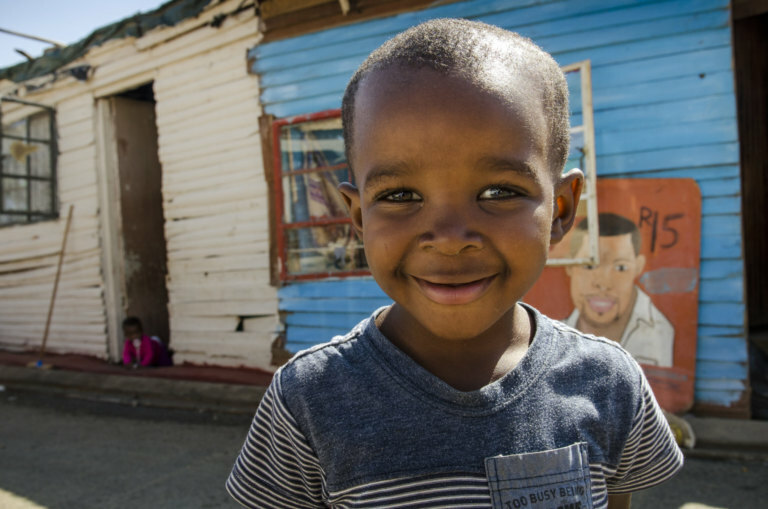 Up to the border crossing, the road is still cobbled, thanks to a South African governmental initiative. Here in No Man’s Land, though, it features a dip into a gravel track. So, phase two. Even taxpayers’ money has its limits. It gets steeper and steeper. 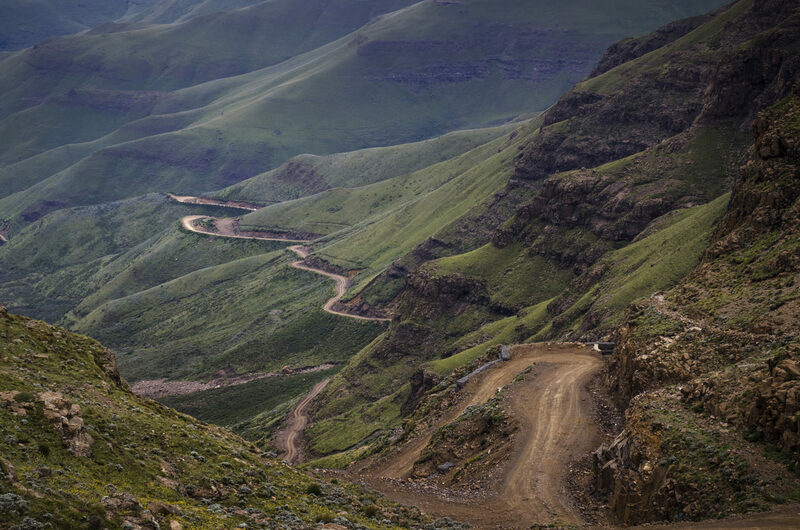 The Sani Pass endlessly snakes up the mountains and with every meter, the view over the surrounding countryside changes. 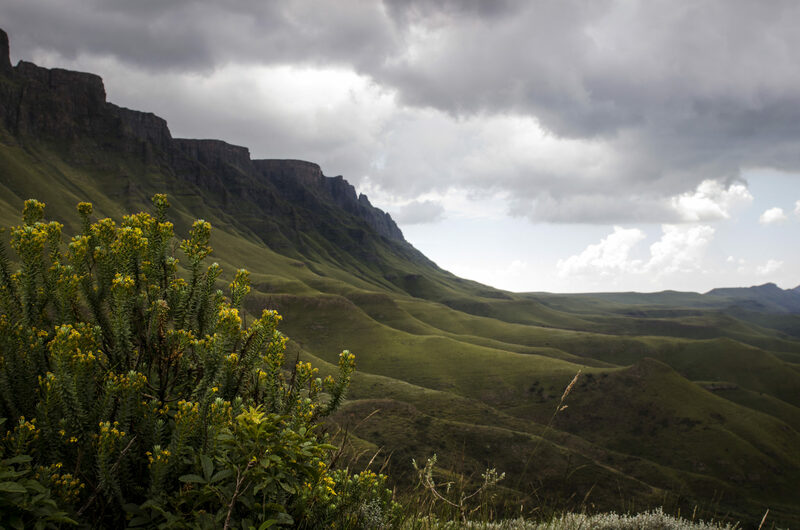 Almost unreal, the enchanted fairytale landscape of the southern Drakensberg Mountains unfolds before the viewer, stretching out more than 100km towards the horizon. You soon get the urge to hold on tight at every bend. Bright green meadows are embedded in jagged mountainsides. Picturesque waterfalls splash across from meagre rock formations. Even the surreal-looking clouds, dancing over the peaks, fit into the picture. They are constantly being moved by the erratic wind. It feels a bit like being in a living Caspar David Friedrich painting. You wonder why the Drakensberg Mountains was only put onto the UNESCO World Heritage Site in 2000. The dirt road is mostly erratic. Crash barriers? Nope. If you roll off the track, you have a long fall ahead. Then there are potholes, as large as buckets. This is phase three: you’ve barely passed a curve before ten new ones appear. They all have terrifying names like Devil’s Corner, Suicide Bend and Hairpin Bend, each one doing its name justice. With each winding road, the Jeep fights upwards. 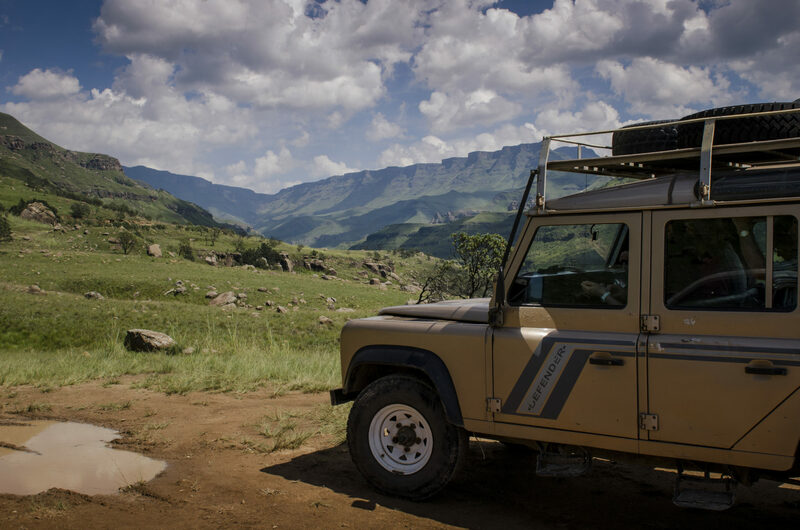 Its motor screams, it rattles, struggling over the rough Sani Pass towards the peak of the Drakensberg Mountains, which is gradually becoming visible over the horizon. 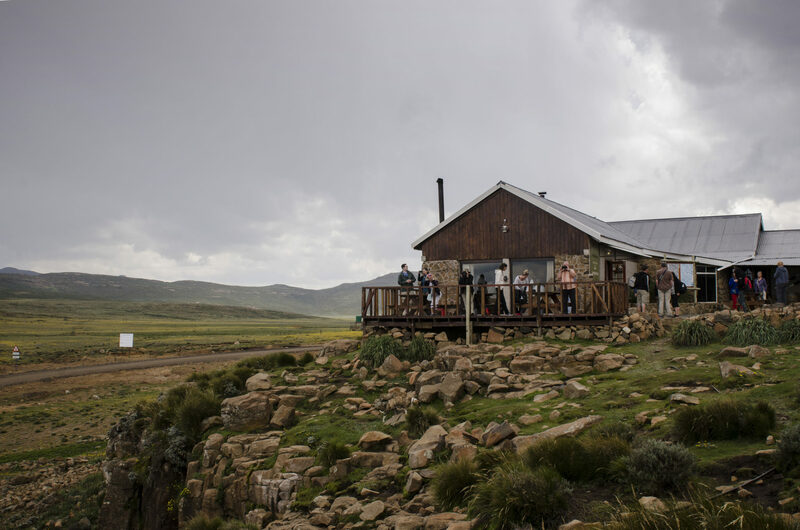 Unlike the adventure-seeking tourists in their four-wheel drives, the local population of Lesotho uses the Sani Pass even in windy weather, for daily trips into the neighbouring country. They squeeze into often completely full, run-down buses that sometimes struggle so much with the slope that it almost hurts. 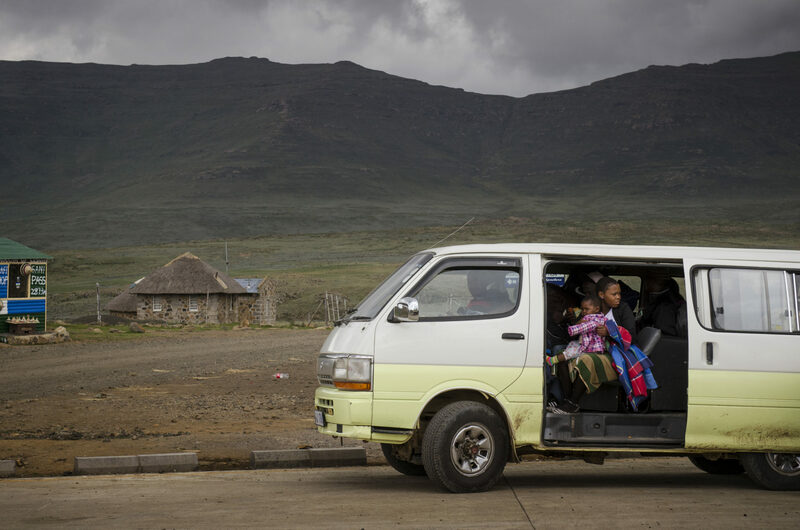 The Sani Pass is the only road connection from the eastern border of Lesotho to South Africa, with the village of Underberg in the South African province of KwaZulu-Natal the only way for them to go shopping or see a doctor. You even see donkeys on the route, fully packed up with sacks and bags. Pack mules were actually a popular mode of transport back in 1913 between South Africa and Mokhotlong, one of the ten districts of the Kingdom of Lesotho. Back then, local trade flourished and turned the winding roads into an indispensable transport route. Today, old ruined bridges are all that remain of the former path. It took more than 40 years for a military Jeep to drive over, in 1948, to prove its suitability for the terrain. Apparently it did pass the test, as just years later the construction of the pass road began. The company responsible is still here today, offering day trips to tourists under the name Sani Pass Tours. Time will tell how much longer this will be necessary. In the near future, the rough road is supposed to be transformed into an asphalted road. 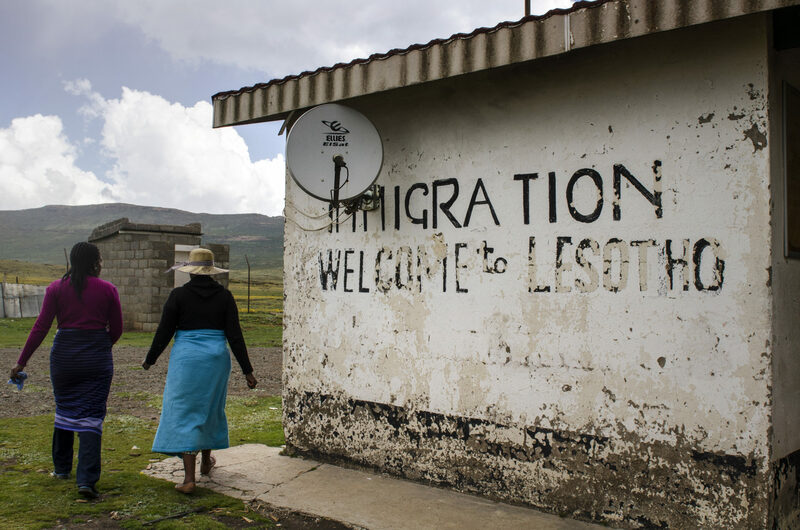 What is surely a well-intentioned initiative from the South African government for a connection into Lesotho – and vice versa – has its disadvantages. Will modernisation blight the pass’ charm? One thing is for sure: the view onto the scenery of the Drakensberg Mountains will be unchanged, but the real Sani Pass experience will irreversibly become a thing of the past. Back to phase three. After covering what is at most half of the route towards Lesotho, the air gets so thin that you notice it with every breath. It also gets noticeably colder. No wonder, as the average height of the country is 2,500m above sea level. The summit of the Sani Pass, however, is almost 400m even above that, at 2,875m. With the goal in front of us, this is climbed even for the puffing 4-wheel drive surprisingly easily. After two exhilarating hours, we arrive at the top. Unlike the mountain passes of the Alps or the Pyrenees, nobody has put up a summit cross in the Drakensberg Mountains, but instead a whole pub. It holds the title of Highest Pub in Africa, safe in the knowledge that some visitor or another will show up to appropriately drink to reaching the summit. Most tourists stop for a pint and a quick rendezvous with the Kingdom of Lesotho before soon heading off again, down the steep Sani Pass, past magical scenery into the warmer fields of South Africa, where the border guard is waiting with a grin on his face, armed with a stamp. Wow. These pics reminded me of Ladakh passes in India. Similar awesome panoramic views and great drives all through! Hi Sreekar, thanks for your comment. Oh, we have never been to the Ladakh passes in India, but they do look incredible. Thanks for the info, we’ll put them on our bucket list. Wow that view is incredible. Definitely so beautiful – I would love to visit there. Saving this post for future use! Hi Claire! Thanks for your comment. 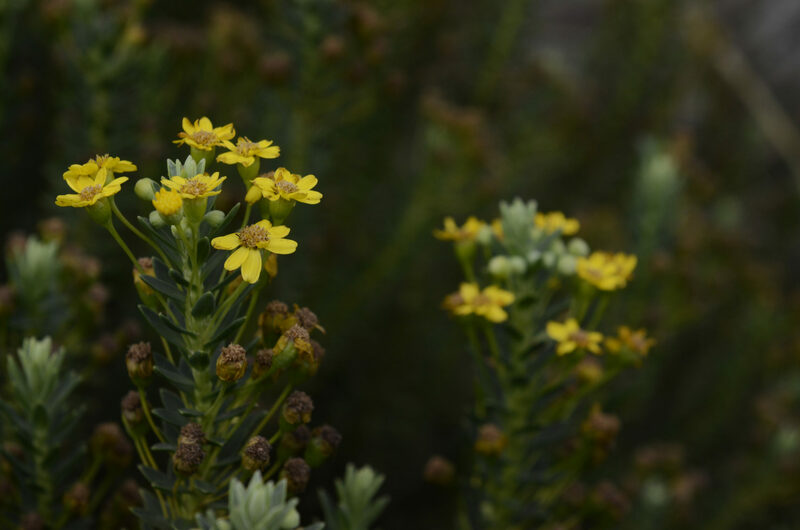 Yes, definitely put the Sani Pass onto your bucket list – it’s more than worth a trip. What incredible landscape. Great account of your travel through the area and the photos are so good. Love your end paragraph about tourists stopping for a pint before meeting the smiling border guard. Seeing a peaceful place, soaring hills. I think this is a really interesting experience. Hey Utminh, thanks a lot for your comment! It truly is a beautiful place. i had no idea that such a place even exists, the pictures are exceptional! Thank you very much Chichi! We appreciate your kind words. While Sani Pass has some terrifying dirt roads like Devil’s Corner and Suicide Bend, I am nevertheless in awe of its wild beauty. It is so different to the city life that I am used too and as much as it is an adrenaline boost it must also be a great way of reflecting on life too! Hi Ana! Yes, you are right. We always feel like, that these kind of adventures make trips special and unique. 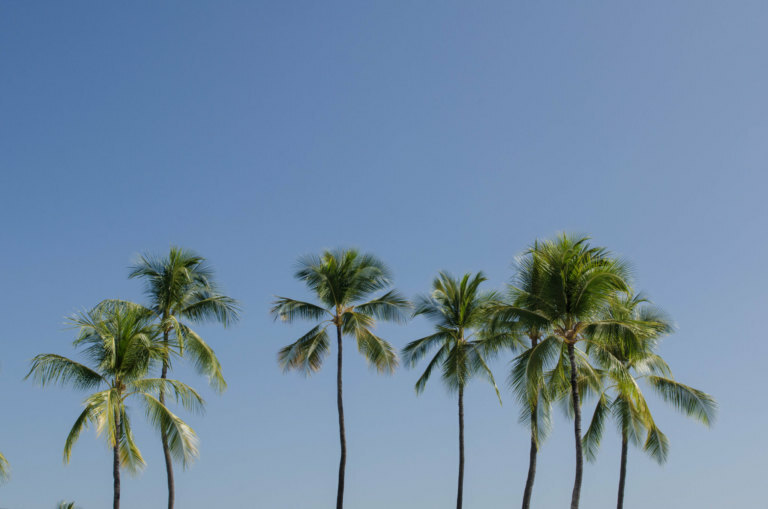 What’s up next on your travel list? Greetings, Anne. This is really a hidden treasure of South Africa. I loved the curved paths and driving across them must be so fun. Incredible place you have explored. Hi Yukti! Yes, Sani Pass sure is an absolute adventure. Thank you for your kind words! Beautiful. So much beauty in South Africa. I drove over several passes in the Cape region including the Swartberg pass which was gorgeous as well (but more desert than the Sani pass). I didn’t realize that there was a no man’s land between the 2 countries. Good read.